The Boost Mobile Stadium Super Trucks series will compete at Sydney Motorsport Park as part of the Australian Motor Racing Series (AMRS) program next week. To be held over the October 26-28 weekend, it will come a week after the series was scheduled to compete as part of the supporting cast to the Virgin Australia Supercars Championship at the Vodafone Gold Coast 600. SST was replaced on the bill by the Kumho Tyres Touring Car Series after CAMS suspended its Australian competition licence. The AMRS is unaffiliated with CAMS, as it is run by the Benalla Auto Club-owned (BAC) Australian Auto Sport Alliance, and therefore can allow the category to compete. “We are super excited to be able to give Australia what they want and that is for us to race,” said SST owner and competitor Robby Gordon. Williams hailed the addition of SST, which has not held an Australian round away from the Virgin Australia Supercars Championship since 2015, to the AMRS program. “Everywhere they go, the Stadium Super Trucks pull a massive crowd, and we can’t wait to have them at Sydney Motorsport Park,” said Williams. “They will put on a spectacular show for everyone watching, whether they’re at the track or viewing the live stream. Lewis-Williams is confident that the trucks are safe to race at a permanent circuit such as Sydney Motorsport Park after modifications which organisers made in light of the CAMS suspension. “Sydney Motorsport Park is a very different venue to a street circuit, and the AASA and our insurers are comfortable with the work Stadium Super Trucks have done on addressing any safety concerns, such as improving the strength of the wheels and incorporating a new locking section for the body work,” he said. “The Stadium Super Trucks are closely aligned to another series that the AASA sanctions, the ARB Australian Off Road Racing Championship, so we’re aware of the strength of the vehicles and similarity of those vehicles to the Stadium Super Trucks. “Our job at the AASA is to assist categories to go racing and that’s the opportunity we’ve been able to create for Stadium Super Trucks who want to keep racing in Australia. “Although one avenue (Gold Coast) was shut down, that’s the beauty of having choice in the market, there is an alternate sanctioning body to give categories an opportunity to make a choice about how they want their motor racing to be run. Defending champion Paul Morris also welcomed the news. “It’s awesome to be able to race in Australia in the Stadium Super Trucks at Sydney Motorsport Park next weekend,” said Morris. 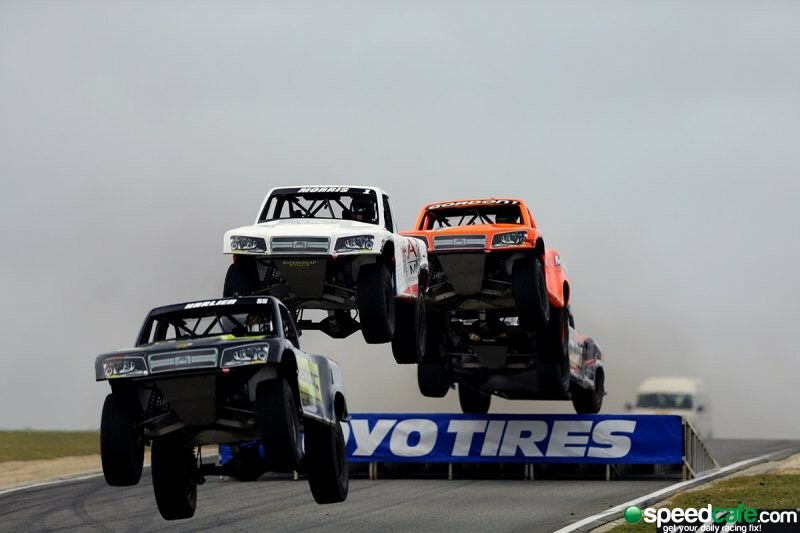 The occasion will be the first time that Stadium Super Trucks has raced at Sydney Motorsport Park. Its previous appearances in the Harbour City both came in 2015, at Sydney Speedway near Parramatta and at the Sydney 500 at Olympic Park. By joining the AMRS bill, SST will share the weekend with 10 other categories, which include the GT-1 Australia, Australian Formula Ford, and Performax TA2 Muscle Car Series, with Sunday’s racing to be live streamed. The news comes after Peter Adderton, founder of the series new Australian naming rights sponsor, criticised CAMS for what he claimed is an ongoing failure to disclose to SST exactly how the series can comply with the governing body’s safety requirements. CAMS CEO Eugene Arocca claims that SST has in fact been informed and that he would not discuss the matter with a sponsor. Matt Brabham leads the series with one more event set to come, at Glen Helen Raceway in California, after Sydney.